Does any retailer today still believe omni-channel is the be-all and the end-all? Retailers who jumped on the omni-channel bandwagon, believing the promise that it would take traditional retail into a new era of better margins and customer satisfaction, are beginning to realize that omni-channel has not only failed to deliver the results promised, but has created a novel set of challenges with which to contend. As omni-channel capabilities edge closer to reality, disjointed strategies continue to miss the mark in captivating shoppers and boosting retail profitability. In fact, in many cases profitability has fallen as margins have continued to shrink. Is this cause for despair? Or is omni-channel simply a waystation in a much longer journey which leads to a totally new world of Seamless Circular Commerce: where one stream of data flows throughout every facet of an organization, creating feedback loops that incorporate the customer into every decision? We argue that the new nirvana that retailers should be striving for is customer intimacy and a personal touch in every interaction. And the core capability that will bring about this nirvana is a single view of a customer across all channels, touchpoints and devices. 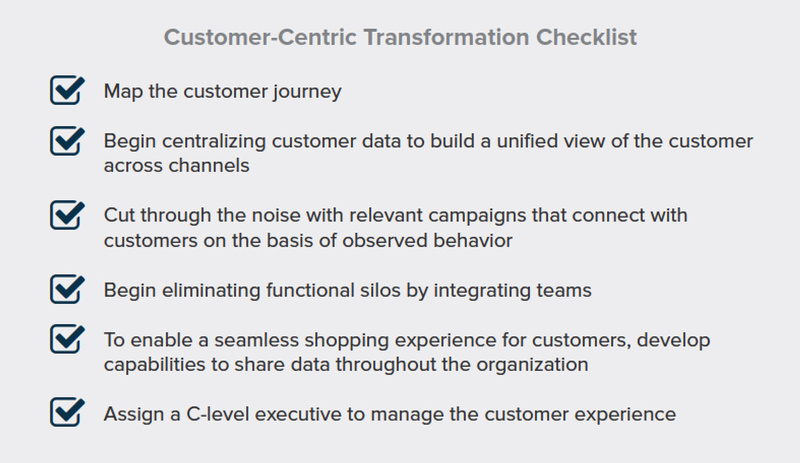 A customer-centric view of the retail organization is needed to complete this trek. As retailers begin transitioning from a channel-centric view of their business to a united, customer-centric one—one which responds to the demands and preferences of clients—some retail leaders are transforming their companies for the future. What can we learn from these leaders and those who are falling behind? Where are we as an industry on this transformational journey? The popularity of digital shopping has only escalated in the past year, with Holiday 2015 predictions indicating that greater than 65% of all retail transactions are being influenced by multiple devices. Retailers have heard the digital wake-up call. Most have moved beyond disruption and well into transformation. This white paper sets out to present a bird’s eye view of the retail transformation underway as retailers enter 2016. It is an insider’s perspective provided by leading CIOs, CMOs, E-commerce, Digital, and Operating executives. The research asked respondents for critical self-assessments of their organizations’ progress in achieving Seamless Circular Commerce, and responses were kept anonymous to ensure they were candid. On the surface, all retailers professed to be focused on their customers. But we found that many still struggle to evolve from omni-channel—which puts the brand at the center of the business—to a model which truly puts the customer front and center. Too many retailers are still unable to see a single customer consistently across all the channels and devices the customer uses to interact with their business. Without shoppers’ individual navigation patterns, too many companies are treating their shoppers as a broad, homogenous group, a move that is not providing strong enterprise-level returns. While a unified brand message or marketing campaign certainly is the sign of consistent brand execution, it is hardly the way to ensure conversion or maximize technology and marketing expenditures. It is time for companies to take a step back, evaluate how well they are responding to consumers’ escalating demands, and benchmark where they rank against other retailers. Interested if you are a Leader, Follower or a Bystander in this movement? Read on. Armed with this assessment, retailers can better develop clear execution plans for the future, plans designed to meet, even exceed, customer expectations. It is important to learn how to create a customer-centric commerce approach, one that will give real insight into customer shopping journeys, as well as the tools and organizational design needed to engage with customers in an individual, personal, and targeted way. The O Alliance is pleased to present the recent findings on the customer-centric transformation currently underway in retail. These insights, shared during the largest independent data survey on the state of customer-centricity in the retail industry, represent the views of more than 150 senior executives representing 100+ retailers in North America and Europe. 22% of the respondents were C-level, and 48% were EVP, SVP or VP level. 90% of the respondents operate both brick and mortar and e-commerce stores. Participants, including companies from across the general merchandise, mass market, specialty and department store segments, representing men’s, women’s, teen and children’s apparel, footwear, accessories, health and beauty, sporting goods, consumer electronics and home décor, responded to a survey conducted just prior to the 2015 Black Friday shopping weekend and during the Holiday 2015 Cyber weeks. Responses reveal the current state of the industry’s singular view of the customer and the execution of customer-centric commerce. Additionally, twenty retailers agreed to participate in qualitative interviews regarding the research findings, sharing deeper insights into the topic. Note: The distribution of retail vertical and size is comparable to the retail universe in developed markets. More than 12% of the companies had annual revenues of greater than $10 billion, with 22% of the respondents from mid-size retailers between $2 billion and $10 billion, 35% between $500 million and $2 billion and 32% under $500 million. The survey responses were confidential. Overall, this paper provides both a current snapshot of the state of the industry, as well as a roadmap retailers can follow to move beyond omni-channel and achieve the goal of customer centricity. We identify five key characteristics of leading organizations. The report also focuses on emerging patterns and trends and where possible includes a response from a retailer who participated in the qualitative portion of the research and agreed to go on the record. Retailers of all sizes and product categories were intentionally included in the survey to represent a cross section of customer experiences. Consumers migrate their expectations across product categories as they experience new digital and logistics capabilities. There appears to be little to no correlation between company size or product types and customer expectations. For purposes of creating a benchmark, and to allow individual companies to know where they currently stand, we scored each respondent based on their survey responses. Respondents were grouped into three categories: Leaders, Followers, and Bystanders. Leaders scored highest, as they have already taken steps to better understand customer data and invest in customer insights, technology and organizational redesign. They are the farthest along on the road to a customer-centric business. Followers are companies with big plans to move towards the customer-centric model, and they are making some progress. They rank in the middle of the pack, close to the average. 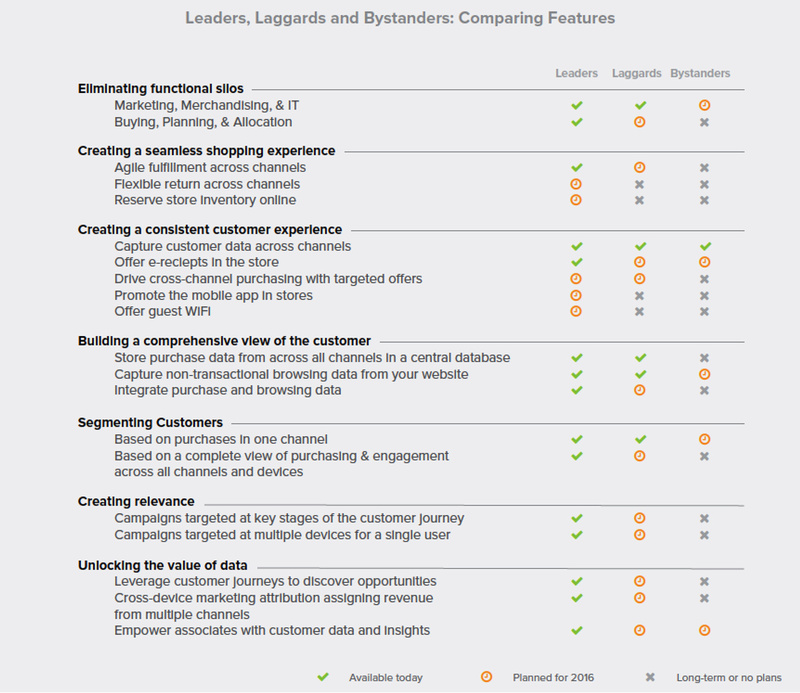 Bystanders scored lowest, showing a lack of meaningful progress and plans to embark on customer-centric initiatives. While there is no clear “one size fits all” approach to customer centricity, it is a concept that is changing the pace of retail. If one finds their organization resembling a Bystander, it bears asking what efforts need to be taken to catch a train that has already left the station. This research shows that the time for change is now. The key to staying relevant to increasingly complex shoppers is to engage those shoppers personally, based on knowledge of their activity across an entire brand, not just a single channel. As companies transition from a multi-channel mindset to an omni-channel model, they also face pressures from nimbler competitors that simply skipped those steps entirely and moved the goal line…to the customer. For example, pure play retailers such as Amazon.com continue to raise the bar on customer-focused service and logistics—putting a stake in the ground as “The Earth’s Most Customer-Centric Company.” Meanwhile, innovative companies with deep-rooted digital backgrounds, such as Rebecca Minkoff and Hointer, are able to quickly open physical locations that blend the power of digital technology with the physical shopping experience. And then of course, there is a device in everyone’s hand that puts the retail store at the customer’s fingertips. arming themselves with the best fleet of digital solutions seems to be easier said than done for many retailers. Retailers struggle to integrate each tool into a cohesive system—one that creates a seamless circular flow of data that learns over time, rather than a patchwork of silos that becomes more complicated with each new addition. This is what a typical customer journey looks like today. the customer-centric model is about giving the brand a single view of the shopper. Too many retailers are still unable to understand a single customer’s path to purchase across all touchpoints and technologies in their stack. It is now the norm for a shopper to browse assortments on a smartphone, read customer reviews on a tablet, and then make a purchase in-store, on a laptop, or on a desktop. Without a customer-centric platform, this single shopper appears as several unique users. The disjointedness of data across a retailer’s channels has made it nearly impossible for retailers to understand their customers as individuals. Furthermore, relying on inaccurate customer metrics, retailers cannot assess their business in a way that allows for consistent progress and profit. A prerequisite to understanding the modern shopper is collecting, storing, and analyzing customer data in a secure way. While many organizations are making strides, there are still opportunities to improve for most retailers. Eighty-six percent (86%) of companies currently record an individual customer’s e-commerce transaction history in a centralized database and 76% of companies do the same for in-store transactions. However, only 63% of companies combine both types of transaction histories in a unified database, according to The O Alliance’s research. This indicates that while a retailer may know a lot about a customer’s purchase history in-store and online separately, they are less likely to be able to connect this knowledge into a single view of that customer across the entire brand. Despite their best efforts and escalating marketing spending, most retailers are finding that there is more work to be done if they want to excel as a true customer-centric company. Retailers need a way to differentiate themselves in the marketplace to become more profitable. This requires a retailer to meet customer demands more expertly than their competitors—an effort that demands an understanding of their shoppers’ behaviors from a single view. however, base their segments on behavior across multiple channels and devices. For organizations that don’t combine their data, a single customer may end up in one segment because of their activity on their phone, a different one based on their laptop, and a third based on their work computer. This could result in conflicting messages being delivered to the same customer, or the same message being delivered too many times. By June 2016, 70% of all retailers will be using customer data to understand and map the customer journey. Of course, not all retailers are prepared to make this commitment. Among industry Bystanders, fewer than half (43%) are using data to segment customers today, only 9% are doing so based on cross-channel behavior, and just 14% are using customer data to understand and map the customer journey. Surprisingly, nearly one-third (32%) of all respondents are not building customer segments today. This forces retailers into broad marketing techniques that treat all customers the same. Consequently, their ability to differentiate themselves through a personal touch is vastly diminished. Many retailers are not equipped to handle the volume and complexity of data entering their systems. growth in the complexity of the data available to retailers. And with it, the fragmentation of that data due to the proliferation of retail channels. As more digital touchpoints are incorporated into the shopping experience, the amount of data generated continues to swell and becomes increasingly difficult to manage. Retailers need to be able to connect a shopper’s activities on their website, in their stores, on social media, and in mobile apps to a universal customer profile. Yet this task is becoming more and more daunting as technology enables customers to engage in increasingly complex ways. The volume of data doubles every two years, and by 2020 the digital universe—the data we all create and copy annually—will reach 44 zettabytes, or 44 trillion gigabytes, according to “The Digital Universe of Opportunities: Rich Data and the Increasing Value of the Internet of Things,” a report from International Data Corporation (IDC).2 With more data flowing into enterprises at faster velocities, basic analytics tools are no longer adequate. In an era when an increasing influx of data provides enormous opportunities for retailers, it is imperative for organizations to leverage sophisticated tools, including predictive analytics. For most marketers today, a single multi channel customer looks like multiple customers: one per channel or device the customer uses. Using basic tools with limited access to customer information can only present a fraction of the total picture—a factor that creates false confidence in retailers who mistake this incomplete data for the truth. These results can also cause other risks, including targeting the wrong messages to the wrong customers. We are halfway to where we need to be. Targeting the multi-touch shopper is becoming paramount, as this shopper is proving to be not only more loyal, but also more profitable. In fact, a report from IDC entitled “FutureScape: Worldwide Retail 2015 Predictions”4 dubs them 30% more valuable than their single-channel counterparts. Engaging these customers on a personal level throughout their journey, regardless of how and where they visit a brand, drives loyalty as well as conversion rates. is proffered. Think of an email campaign that offers a discount only redeemable in-store, or a display ad that prompts a customer to download a mobile app. first-click and last-click models. Having an accurate sense of which marketing efforts are driving dollars back into your business—and which aren’t—is key to making smart decisions and keeping customers happy. Leading retailers acknowledge this: Leaders are six times (6x) more likely than Bystanders to have cross-channel attribution in place today. No Leaders said that cross-channel attribution is not a priority, yet 12% of all retailers are not focused on it. of which marketing campaigns were actually contributing to a purchase when a journey spanned multiple site visits or multiple devices. By June 2016, 72% of marketing campaigns will be tailored to various stages in the customer journey. By this date, more than half (57%) of respondents’ cross-device campaigns will target customer across multiple devices. “Customers are looking for brands to connect with relevant messages based on how they shop, engage, and what they have purchased. Time and again customers show that they will respond with higher conversion and spend,” says Jim Thompson, founder of Lift Engagement, an O Alliance partner. But retailers need to be able to measure the effect of these campaigns, or they risk wasting money and time. There are many issues that plague marketers today. Some marketers still insist on connecting with their shoppers via mass marketing strategies ranging from poorly segmented direct mailings, flyers, email blasts and broadcast media efforts. Often based on old or incomplete information, these marketing methods fail to view and treat customers as people whose wants and preferences change over time. Marketers end up wasting a lot of money targeting the wrong people. Or worse, they upset good customers by spamming them with irrelevant offers. But marketers who can use data to stay on the right path will be more apt to win and keep those coveted multi-channel shoppers. As retailers strive to deliver a consistent message brand-wide, they need to work from one single point of truth—whether that is customer data, marketing information, campaign and promotion redemptions, inventory management, or pricing files. To achieve a true single point of truth requires all mission critical, back-end solutions to be tightly integrated and built with forethought to evolving digital commerce and retail operations, as well as the business intelligence and related data analytics needed to measure operations and results. These issues are only compounding, and the “technology debt” created by postponed technology investments may be crippling. Unable to amalgamate even internal transactional data, organizations are now faced with additional data integration challenges. For example, while three-fourths of companies have invested in in-store traffic counters, only 11% report that they track store traffic and browsing patterns inside the store using beacons, Wi-Fi, geolocation or other technologies. Only one-third of companies reported that customer files include on-line browsing behavior and other non-transactional data. Even fewer, only 9%, currently link social media activity to their customer data files. How fast are these changes happening? Perhaps too slow. Only 18% plan to incorporate in-store browsing behavior and traffic data within the next 6 months and almost half (47%) have no plans to utilize these valuable data patterns. Interestingly, social media data may be first to be integrated by most. 70% of companies will be storing this rich behavioral data by June 2017. The only way to gain real-time access to information, consolidate data, and achieve consistency brand-wide is to adopt a flexible foundation that can grow with a company’s needs cost-effectively. This is why today’s leaders are moving in the direction of cloud-based solutions. lower upfront investments than traditional systems; and they increase adaptability to changing market conditions and new technologies. Besides, with data more readily available to the entire organization, customer engagement can be both more responsive and personalized. In the quest to create a Seamless Circular Commerce organization, retailers must embrace that every business decision should be based on knowledge of customer behavior brand-wide. Just as breaking down the walls between channels is a must, the same tactic must be applied to all lines of business, so that all decision makers can share and use information needed to improve customer engagements. 81% have integrated marketing teams brandwide, 74% have integrated IT teams, 72% have integrated merchandising teams, and 66% have integrated inventory planning, buying and allocation roles. competition. And without a single source of data to feed these teams, executives doom themselves to making misinformed business decisions. To lead the integration of teams, retailers need to appoint leaders to champion the task. Champions are also needed to ensure that customer-centric data be disseminated across the enterprise. As expected, retail Leaders are stepping out to address the talent and leadership issues demanded by these changes. While specific titles vary between companies, the pattern is clear: Leaders have assigned a key executive to manage the customer experience across channels. Forty-three percent (43%) of companies either have or plan to have a C-level executive in a customer-centric role. Specifically, 15% have appointed a “Chief Omni-Channel Officer,” 13% have a “Chief Customer Officer,” 10% have a “Chief Customer Data Officer,” 7% have a “Chief Customer Experience Officer,” and 6% have a “Chief Customer Engagement Officer,” The O Alliance’s study revealed. While these efforts are commendable, these statistics leave a lot of room for much-needed attention and improvement. The fact that 57% of companies have no plans to add a customer-centric executive to their team may stem from a lack of willingness to change. As the customer evolves, retailers need to make a genuine organizational commitment to evolving too. Regardless of where the blame lies, those companies that continue to ignore this strategy will continue to find themselves in the Follower and Bystander categories, and struggling to play catchup as their competition garners the customer loyalty needed to remain a competitive player in an increasingly volatile marketplace. new leaders that will drive this new stage of the business,” explained the company’s CMO. “This requires getting organizational buy-in for new teams to learn to work together, as well as taking steps to build confidence in new systems and approaches. By putting digital solutions in the hands of employees, specifically systems that keep them abreast of business and shopper information, retailers are in a stronger position to bolster customer engagement and drive loyalty. Whether it is through smartphones, tablets, stationary or mobile POS stations, or desktops fixed on the sales floor, these solutions keep associates in tune to inventory levels and availability, cross-channel order status, and shoppers’ history and preferences. It is encouraging that 47% of companies reported their front-line employees have access to relevant customer data while they engage with customers. And with only 15% of respondents saying that this is not a current priority, this will be a strong focus area within the next 18 months. organizational structures that slow progress, frustrate executives, and obstruct the path to a customer-centric retail model. When we asked retailers to identify the obstacles to a single view of a customer, surprisingly only one of the top answers had anything to do with technology. Are the obstacles in the chart below universal across retailers? The data suggests they are. While a slight deviation exists in the area of available talent for the retailers under $500 million in revenue, there were virtually no other major variances, and this slight deviation may be based on the inability of smaller organizations to pay top-tier salaries to recruit and retain top talent. But on all other factors, retailers of all types and sizes expressed similar concerns. It is clear from the responses that creating Seamless Circular Commerce will not result from actions taken exclusively in the CMO’s and CIO’s offices. Human Resources, Finance, Executive Committees and Boards must also be part in this shift in direction. Interestingly, these top box obstacles are more organizational than technological. So how did the Leaders stand out? The overarching answer is by showing organizational commitment to the customer through customer-focused leadership roles. Leaders have worked to align all functions within the organization around a single clear mission: understanding and serving the customer. Leaders are “building capabilities” versus buying point-to-point technology solutions to achieve this goal. Leaders are building data ecosystems that support a comprehensive view of customers across the organization. Leaders are data obsessive, and see it as a new organizational currency versus an organizational burden. Leaders are hunting for new ways to capture, analyze, and use data to serve their customers in an increasingly personalized way. Leaders are utilizing cloud-based solutions, or planning major moves towards cloud providers. Leaders have a multi-year transformation roadmap, but also have left the flexibility, both financially and operationally, to test and adopt new solutions that are consistent with the customer-centric philosophy. While all Leaders do not have expensive innovation labs, all have created methods for evaluating and onboarding new technologies to ensure innovation is not missed. And Leaders do not think they are at the end of the transformation journey, but rather in midstream. To begin to move towards consumer-centricity, retailers must first seek a view of their customers that encompasses behavior across all channels, regardless of the touchpoints they use. This single view of a customer “bridges the many digital and traditional touchpoints that customers access to better serve customers, streamline IT operations and improve the bottom line,” Tom Litchford, NRF’s Vice President of Retail Technologies, said in a company statement.10 Once this foundation is in place, retail can finally come full circle and become a newly valuable business model—one in which customers interact with one brand, and brands serve one customer. How their customers truly shop throughout their lifetime with a brand, across multiple devices and channels, allowing them to create a better shopper experience. The end result is long-term customer loyalty that promises to drive revenue and profit. The retail industry is finally embracing digital customer touchpoints as a means of driving engagement. Most are fairly far along on the omni-channel track. However, omni-channel has created a data problem for retailers: they have lost the ability to interact with a single customer in a personal and intimate way. Relying on traditional marketing strategies, legacy systems, and inadequate business intelligence tools, retailers are still struggling to drive loyalty and profitability. A lack of a data-driven single point of truth and an unwillingness to move away from historic organizational silos have compounded the problem. By transitioning toward a united, customer-centric commerce platform, one that embraces data and open, web-based, integrated solutions, retailers can finally transform their disjointed businesses into seamless customer serving machines. engage with their brand using customer journey maps. preferences, and engage individual customers in a more personalized way. as the supporting systems needed. personalized engagement vehicles to interact with specific shoppers. customer interaction, retailers can add value to the shopping experience. The O Alliance’s proprietary Seamless Circular Commerce model, and its organization alignment process, “The O MethodTM,” places all customer behaviors and preferences at the center of commerce creation. The Circle of One is at the heart of this proprietary process, which replaces ― rather, disrupts ― outdated organizational structures, information siloes and omni-channel attitudes to maximize the value of customer data. “The O MethodTM” condenses massive amounts of customercentric retail data currency into commerce creators across the entire retail ecosystem: Information is leveraged from myriad domains to drive lifetime customer value and increase wallet share. With customers at the core, all retail processes and customer touch points are seamlessly interrelated. Today’s shoppers will browse a product on their smartphone, read reviews on their iPad, and then make a purchase in-store. However, most retail/ecommerce businesses keep channel-specific data siloed in disconnected systems and have no way of knowing they’re dealing with a single customer. Retailers need a way to bring all of those interactions together, connect the dots, and see a unified view of every customer. measured in hours, not days or weeks. To learn about how Revmetrix can help you create better, smarter interactions at every point of engagement with your customers, email us at info@revmetrix.com or call us at (646)902-4REV. “The New Digital Divide.” Accessed December 20, 2015. Things.” Accessed December 22, 2015. “Annual Merchandise Planning & Allocation Survey.” Accessed December 15, 2015. Blog. Accessed November 25, 2015. “A New Era for Retail: Cloud Computing Changes the Game.” Accessed December 27, 2015. “Methods and Practices: Cloud in Retail.” Accessed November 18, 2015. Retail Federation. January 28, 2015. Accessed December 22, 2015. “Building Omni-Channel Retail From the Back-End Up.” Accessed January 3, 2016.